June 6, 2014 – As part of its ongoing support of responsible energy development in Utah, TransWest Express LLC was among the sponsors and exhibitors at this week’s Utah Governor’s Energy Development Summit, held June 3-4 in Salt Lake City. 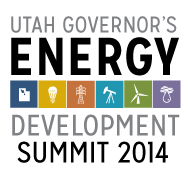 The third annual event – hosted and organized by Utah’s Office of Energy Development – focused on achieving the state’s goals of economic prosperity, energy independence and a reliable, affordable energy supply. More than 1,300 people attended the workshops and energy expo featuring various exhibits and interactive energy displays, as well as heard presentations by Utah Gov. Gary R. Herbert, elected officials, state and federal agencies, industry experts and others. TransWest was on hand to update attendees about its TransWest Express Transmission Project, a proposed 3,000 MW direct current transmission line to deliver renewable energy while increasing the reliability and capacity of the western power grid. This transmission project is designed to provide for a potential future interconnection at the Intermountain Power Plant and its transmission system near Delta, Utah. An Environmental Impact Statement is being prepared by the Bureau of Land Management and Western Area Power Administration as joint lead agencies, which have scheduled the release of their Final EIS by September 2014. TransWest has served as an energy summit sponsor all three years that the event has been held.